Your Prayers, Our Magic--Do They Always Help? It's a common argument among Pagans--Witches in particular--when conversing with monotheists to say something like, "What you call prayer, we call spells," or words to that effect. No doubt we think ours are better. No one is testing them, but there have been a number of studies attempting to quantify the effects of "intercessory prayer," usually meaning prayer for people facing health crises. Some seemed to show that such prayer helped, results that were seized upon by Christians. The study received some attention at the time [three years ago], but seemed to have escaped the notice of many Christians, probably because of its surprising—and for Christians, disturbing—conclusions. The result: The group [of surgical patients] whose members knew they were being prayed for did worse in terms of post-operative complications than those whose members were unsure if they were receiving prayer. The knowledge that they were being prayed for by a special group of intercessors seemed to have a negative effect on their health. Where does that leave people who say that you should get permission before "working" for anyone? Our prayers are nothing at all like magical incantations [!]. Our God bears no resemblance to a vending machine. The real scandal of the study is not that the prayed-for group did worse, but that the not-prayed-for group received just as much, if not more, of God's blessings. In other words, God seems to have granted favor without regard to either the quantity or even the quality of the prayers. And then they have to jump through more theological hoops to answer the obvious question, "Then why pray at all?" Obviously, that is not our theology. Pagans do not expect the gods to conform to our standards of either/or logic. But try reading the article and substituting our language for its authors'. How would you respond? Lupa posts on bioregionalism, animism, and ecopsychology. When M. was in grad school in psychology in the 1990s, she hoped that ecopsychology would be the Next Big Thing. Articles on the psychological affects of interacting (or not) with the non-human world were popping up in places like McCall's magazine. Addressing "nature-deficit syndrome" would be a component of it--even the Girl Scouts are onto that. But as an overarching concept--even without acknowledging "spirits of place"--ecopsychology does not seem to have caught fire except in a low-level therapeutic way: "Gardening makes you feel better." Possibly related is the way in which a certain kind of self-righteous environmentalism may be ripe for mocking. Are we still too leery of assigning spiritual value to non-human nature? Doing so has been a component of American spirituality since around 1800, as Catherine Albanese wrote in Nature Religion in America: From the Algonkian Indians to the New Age . But it has always been a minority position, although a well-established one. I used to start my nature-writing students with the "Where You At?" quiz. It offers a quick immersion in bioregional thinking and blends both non-human and human cultural material. The Examiner blog network, which signed Murph Pizza to cover Paganistan, now has a Pagan travel writer, Paula Jean West. Are we a niche market, or what? Don't turn your soft, computer-tapping hands away from the keyboard and pick up a hammer. That seemed to be the message in Sunday's New York Times. Self-reliance is dangerous. This woman made a mistake when replacing a toilet. So, therefore, she should not learn from her mistake and do it right the next time. She could call a plumber instead. When in doubt, do nothing. Call the authorities. Then there is this story about a peril for urban gardeners -- lead in the soil from the days of leaded gasoline and older paints. The hazard could be real -- and the article presents some fixes -- but I cannot help thinking that the underlying message is "Don't even try growing your own food." Remember, boys and girls, the government and the official state-approved priests always know what is best for you. In my role as a volunteer fireman in this little hamlet, I went to a "vehicle extrication" class today in a nearby town. That meant learning to use the "Jaws of Life" (firemen just say "splitter") and other hydraulic tools for ripping apart vehicles in order to remove injured occupants. Cut It. Split it. Ram it. I'll bet Uncle Aleister would have liked to see us ripping the roofs and doors off of motorcars. • Ten myths about the brain. • Paganistan gets a designated blogger in the Examiner network, Murph Pizza. • A "prehistoric pin-up"? Archaeological video from the journal Nature. I blogged recently on concentrating on one's work in an online world ... wait, I have to check some blogs ... OK, I'm back. What are the dogs barking at? I sometimes find that low-volume, rhythmic, bass background sounds (e.g., the thrumming of an airplane’s engine, some examples of techno music) help me to concentrate, or, at least, to concentrate on material that doesn’t require my full attention. I concur. (movie reference--got to look it up.) An iPod loaded with "trance" or some techno music can indeed put me in a bubble where I can get some kinds of work done. When I compare working at home now to the last time I did it (1990-1992), I can see the difference in three letters: DSL. When email meant dial-up and Compuserve charging me by the minute, I monitored my online time carefully. Now concentration comes harder. Sometimes I work in the guest cabin, because it has no telephone -- not even a cell-phone signal -- and of course no Web access. Furthermore, says Winifred Gallagher, author of Rapt: Attention and the Focused Life , "multitasking is a myth." “You cannot do two things at once. The mechanism of attention is selection: it’s either this or it’s that.” She points to calculations that the typical person’s brain can process 173 billion bits of information over the course of a lifetime. 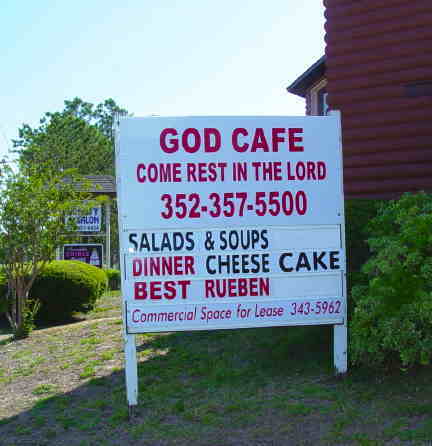 The God Cafe in Eustis, Florida. Closed on Sundays. Here is some background.